As lawn care is one of the easiest industries to enter due to the low startup costs involved many entrepreneurs finance themselves into their business. However for those wanting to purchase a suitable vehicle or buy the latest equipment right from the start then some external funding may be required. It is worth saving up to buy your own equipment rather than borrowing money. By starting off small and growing slowly you can avoid the risk of taking on too much debt. You may need access to credit later on if your business expenses are higher then you expected or revenue growth is slow. Having access to credit further down the line could save you from bankruptcy or help you expand your business. It is therefore a good idea to leave your options open by staying debt free for as long as possible. If you really do need to seek funding and you can't get a loan from family then make sure that you have a well written lawn care business plan that you can take to potential lenders. In this article I look at some of the sources of funding that newcomers to the lawn care industry may consider. If you have a good account history with a bank and discuss your ideas with them you may qualify for a loan. Banks are used to lending money to entrepreneurs wanting to start up their own businesses. Discuss their lending criteria with them and look at some of the options that local banks have available. It is likely though that you will have to have some assets that you can use to borrow against or somebody who can act as a guarantor. One approach that you may consider is looking for an investor who could contribute a portion of the required startup capital. They may not insist on being actively involved in the day to day operation of your lawn business and may only want to own a share of your business. If you are prepared to go through the process of applying for a small business grant from your state or government then this option is also one worth looking into. This route is not an easy one though and the small business loans and grants that are available are always far outnumbered by the applicants. Look into the options that are available and see if you fit the requirements. Work on a 'plan B' at the same time in case your application is not successful. 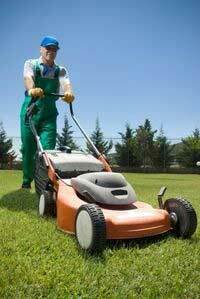 As the funding requirements for a lawn care business are minimal you could consider getting cash advances on a few credit cards to raise the necessary funds. You could also put large purchases of items such as lawn care equipment on your credit card. Don't take this option lightly though. If you are not able to start making repayments within a fairly short period of time the interest rates involved can allow your debt to get out of control. Starting a lawn care business does not really take a lot of investment and the best approach is to look at funding it yourself. No matter how you go about raising funding for your new lawn care venture make sure that every dollar is put to the best possible use.